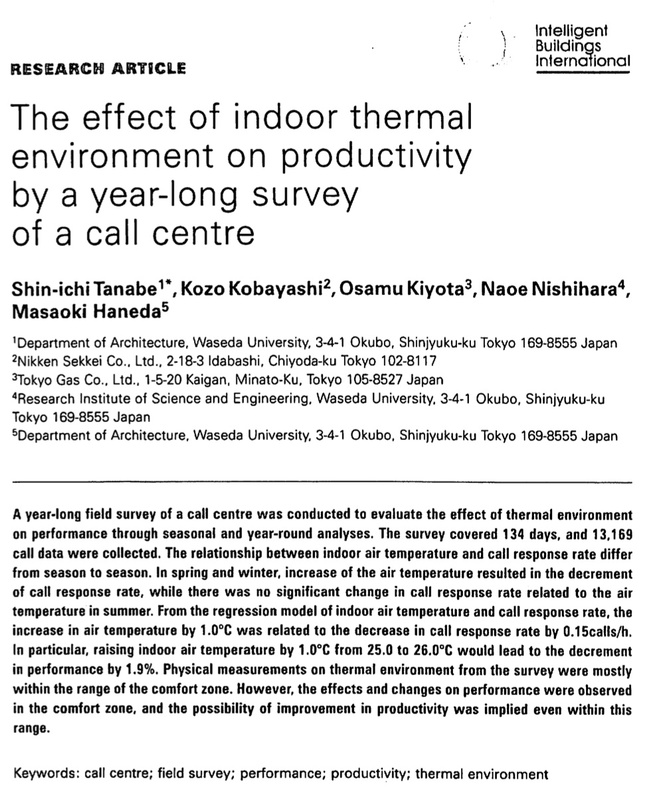 That's the magic number for how worker productivity responds to warm/hot temperatures. In my 2010 PNAS paper, I found that labor-intensive sectors of national economies decreased output by roughly 2.4% per degree C and argued that this looked suspiously like it came from reductions in worker output. Using a totally different method and dataset, Matt Neidell and Josh Graff Zivin found that labor supply in micro data fell by 1.8% per degree C. Both responses kicked in at around 26C. [I]n the past year, [Japan] became an unwitting laboratory to study even more extreme air-conditioning abstinence, and the results have not been encouraging. After the Fukushima earthquake and tsunami knocked out a big chunk of the country’s nuclear power, the Japanese government mandated vastly reduced energy consumption. To that end, lights have been dimmed and air-conditioners turned down or off, so that offices comply with the government-prescribed indoor summer temperature of 82.4 degrees (28 Celsius); some offices have tried as high as 86. Unfortunately, studies by Shin-ichi Tanabe, a professor of architecture at Waseda University in Tokyo who has long been interested in “thermal comfort,” found that while workers tolerated dimmer light just fine, every degree rise in temperature above 25 Celsius (77 degrees Fahrenheit) resulted in a 2 percent drop in productivity. Over the course of the day that meant they accomplished 30 minutes less work, he said. I have said before that empirical social science should strive to replicate results and obtain similar parameters. I think we are getting there on this one. And in case anyone is [still] listening, I [still] think that persistently reduced labor productivity may be one of the largest economic impacts of anthropogenic climate change.